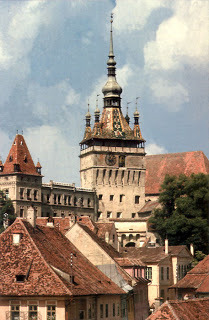 A charming medieval town, Sighisoara seems ideal destination for lovers of history, knights and princesses. City with extensive cultural traditions, Sighisoara hosts annually between 27 and 29 July, Sighisoara Medieval Festival, and exacerbating and thus promoting the main feature, that of the medieval city. Narrow, winding streets, specific times long past, transporting visitors into another world with other characters, and if tourists will arrive in the city during typical medieval festival will have the opportunity to discover long forgotten traditions and customs. Almost every building in Sighisoara has a story worthy of being known. For example, on the way to the old city, tourists can discover the memorial house and bust scientist Hermann Oberth, born in 1894 in Sibiu. He followed the family in Sighisoara, teaching eight years at the Hill Gymnasium. World War will compel them to continue their studies in Munich and Neidelberg but will return later teaching profession practicing in Sighisoara and Medias. Clock Tower - the symbol of the medieval townClimbing, tourists will find the main gate to the city, tall, arched and reach one of imaginil symbols of the medieval fortress, clock tower, which today houses the Museum of History of Sighisoara.Built in the thirteenth and fourteenth centuries with main gate tower, which will house, from the fourteenth century until the middle of the sixteenth century the city council seat, making a building of great importance. Inside this chamber could deliver and exeuta death penalty sentences. Insignia local authority enjoyed this edifice are visible, the four towers about 12.5 meters high, located on the corners of the building serving to mark the importance of building in city life. On each side of the tower meets one clock symbol in the life of Western medieval castles and niches with figures: Peace with trumpet and olive Ramu, Justice, Justice and two smaller figures marked craftsmen working day Day and night. Today in History Museum can be visited Sighisoara torture chamber, where one can find extremely interesting exhibition of objects of medieval torture. Also, weapons enthusiasts, you can visit Museum's Medieval, which houses a collection of weapons, military equipment and techniques. Personally, I recommend visiting the top floor of the Clock Tower. The view is extraordinary, tourists can have a complete overview of the whole city. However, to reach the top floor, visitors have to climb stairs narrow and very uncomfortable to walk Cori tight and short, but the view is worth every effort.